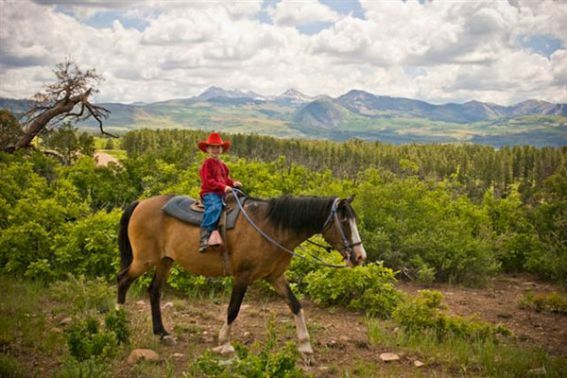 Majestic Dude Ranch has been selected as Trekaroo’s 2013 Best Ranch for Riding. Check out the other ranches that made the cut. 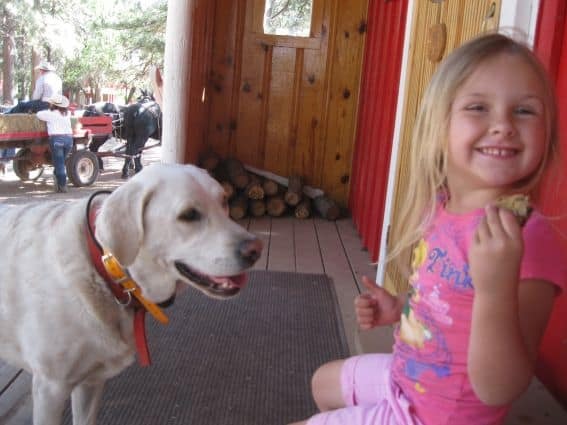 Trekaroo readers can Save 20% off their family dude ranch vacation at Majestic Dude Ranch. Details: 20% off discount valid through the entire 2013 season with no blackout dates. Book online using the promo code: MDFRIEND. 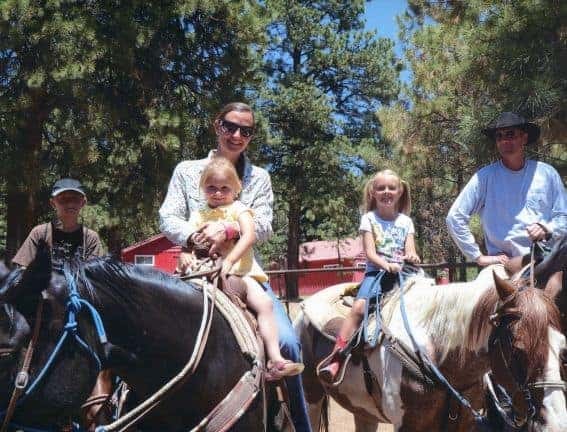 My family spent a week as guests of Majestic Dude Ranch, where we felt as if we had starring roles in the television series Bonanza mixed with a little Duck Dynasty reality TV. We can honestly say it was one of the best family vacations we have ever had! Majestic Dude Ranch espouses two things that these television series celebrate: family and the great outdoors (no camouflage clothing required). Although I liken our visit to TV shows, the ranch and its namesake are tied to the movie The Majestic, starring Jim Carey. The movie mirrors the life of Majestic Dude Ranch owner Robert Bucksbaum, by coincidence. Although Robert never suffered amnesia, like Jim Carey’s character, he did write a screenplay, serve as an Army Airborne Ranger, and own a Los Angeles theater. Because these events from Robert’s life are similarly portrayed in the movie, he named his new adventure Majestic Dude Ranch. Robert’s interesting life story is definitely movie material. Robert grew up poor, yet fulfilled his childhood dreams to own a theater that served popcorn and operate a dude ranch. Robert is the heart and soul of the Majestic Dude Ranch, a hands-on owner, and a very admirable character. In fact, Robert’s endeavors make me think it may not be too late to fulfill my childhood dream to become an astronaut! As I mentioned, my visit to Majestic Dude Ranch felt like a role in a TV show. 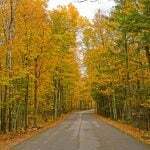 Maybe it was the ranch’s setting, reminiscent of Bonanza’s high desert Ponderosa pine forests. Maybe it was the wranglers, reminiscent of the “full of wisdom and fun” Duck Dynasty family. Maybe it was the varied personalities of staff and guests, reminiscent of the Cartwright boys’ assorted temperaments. Maybe it was the endless supply of down home cooking, reminiscent of Miss Kay’s evening supper spread, often seen in Duck Dynasty. Or, maybe it was just that pair of comfortable cowboy boots that I borrowed from the ranch. Regardless, I played my cowboy role well. 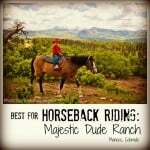 On the first full day at Majestic Dude Ranch, guests are assigned a mountain bike and a horse. Mountain bikes can be taken and used to explore the ranch independently. The horses, on the other hand, require wranglers to tag along. This turns out to be a pretty good policy, since the wranglers at Majestic Dude Ranch are skilled horsemen and actually pretty entertaining. They know how to muster up plenty of cowboy wisdom, cowboy poetry, and a few stupid jokes, all while making sure everyone on the trail is safely enjoying the ride. 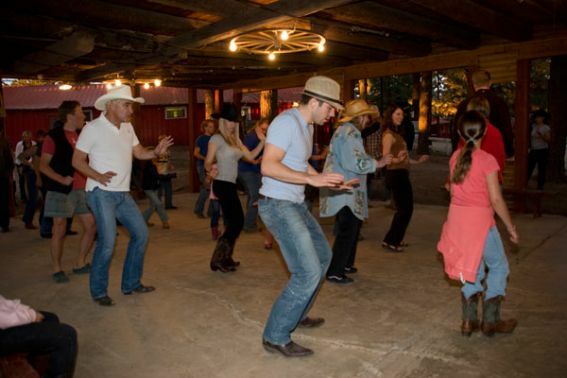 Horse and mountain bike trail rides aren’t the only activities at Majestic Dude Ranch. This ranch is an outdoor lover’s oasis with direct access to millions of acres of pristine San Juan Mountain wilderness. Glide a kayak over the adjacent Jackson Gulch Reservoir while eagles and osprey soar above. Cast a line and reel in a trophy trout. You can even call in some ducks, if you’re so inclined! When guests aren’t too busy exploring the adjacent reservoir and trails, the ranch offers plenty of in-house activities to enjoy. Majestic Dude Ranch is the only dude ranch sporting a field of dreams baseball diamond and a professional batting cage. I’m no sports nut, but I rediscovered just how much fun playing baseball can be, especially when I had the pleasure of tagging my husband out on 3rd base one evening. Kids will love playing baseball just like the adults, and they’ll also love the swimming pool, playground, teepees, petting zoo, never-ending supply of cookies, and the notorious ranch dog, Mike (who also loves the never-ending supply of cookies). We have: gentle horses for gentle people, spirited horses for spirited people. And, for people who don’t like to ride, we have horses that don’t like to be ridden! Majestic Dude Ranch has plenty of fine horses and plenty of interesting people, guests and staff alike. You’ll get to know these groups quite well: the gentle, the spirited, and even those who don’t like to ride. If you don’t like horses, you probably still won’t like them after a week at Majestic Dude Ranch. If you don’t like people, you may be surprised to find that a friendly game of baseball, a few margaritas, a ping pong table, and a bunch of cute kids can really bring a group together. In one short week, my family found several new friends, people we would have never known otherwise, if it weren’t for the ranch. As far as the horses go, we’ll take them all: gentle and spirited (especially if they come with a comfortable pair of boots). Our last night at Majestic Dude Ranch was bittersweet. Adult guests immersed themselves in a cocktail party full of stories about their week’s adventures, while all of the kids ran amuck throughout the ranch. After dinner, the guests sat around the karaoke machine with all inhibitions extinguished. My 11 year old leaned over and whispered in my ear, “If your cable goes out, you get bored. When you get bored, you write travel reviews on Trekaroo. When you write travel reviews on Trekaroo, you visit a dude ranch. When you visit a dude ranch, you attend a cocktail party. When you attend a cocktail party, you sing Mama Mia at Karaoke Night…Don’t sing ‘Mama Mia’ during Karaoke Night at a dude ranch. 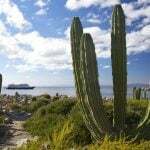 Get DirectTV.” I chuckled at his silly joke. As for me, I’ll sing “Mama Mia” in a comfortable pair of boots during Karaoke Night at the Majestic Dude Ranch anytime, and I’ll gladly forgo the cable TV. Trekaroo readers can score a 30% discount to the Majestic Dude Ranch if they book online and use promo code: DTWPRO. Disclosure: Thanks to Robert Bucksbaum and the wonderful staff at The Majestic Dude Ranch for hosting my family. 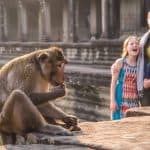 Although my family received complimentary lodging, dining, and activities, my reviews are always my own opinions and are not influenced by staff or its affiliates. Looks like so much fun! A dude ranch vacation is on my bucket list. Would LOVE to try a week like this… I love the idea of spending the week riding, etc., but I also like the fact that they have other diversions like baseball. 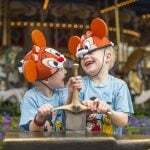 Sounds like a great way to make memories with the kids! How neat! Would love to do something like this… but convincing my husband… yeah, that would be the hard part! LOL. Katie – husbands aren’t required to enjoy a Dude Ranch vacation. One of the guests during my visit left her hubby and daughter home and enjoyed the week with her young son. Talk about some awesome memories! What a great vacation! I love your 11 year old’s sense of humor, lol. 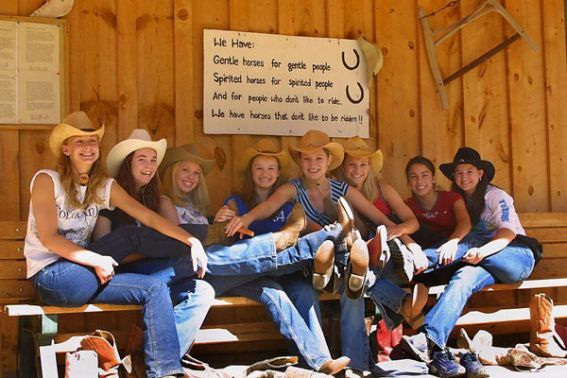 I have never been to a dude ranch, but “dude” that looks awesome…I am all for new experiences! Love the photos! I have always always wanted to visit a dude ranch with the kiddos. Maybe next summer. This looks like a blast! Thanks for sharing. I noticed in the comments that some partners might be “Dude Ranch” hesitant. On my Writing Horseback blog I review horseback riding vacations; many with golf, fly fishing and spas for the non-riders in the group. We just took our four oldest grandchildren (7,8, 8, and 12) to the ranch for a week in July and had the most amazing, awesome time ever. The kids and grandparents just loved it! Memories to last a lifetime to be sure. Great staff and other guests too. Such freedom for the kids, so many choices of activities, great meals, and the list goes on and on. Highly recommend it! 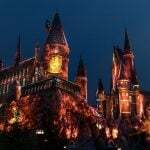 I worked there the past couple of years, and it was a blast! Hope everyone and anyone that has a chance to go, takes advantage of it!